Last week it was the simplest banana pancakes and now this!!!!! 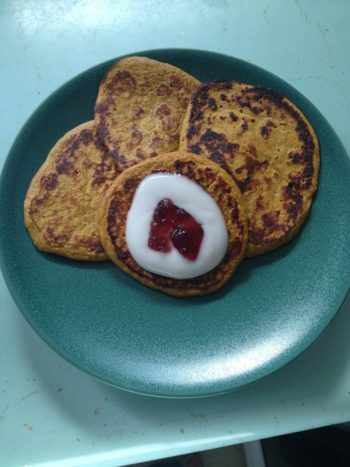 2 Ingredient Sweet Potato Pancakes!! Did you try the pancakes from last week’s post yet? What are you waiting for? Maybe you were saving yourself up for this one! I was so excited to try this since I love love love sweet potatoes. I often just cook up a few and eat them throughout the week. My new obsession is baked sweet potato slices with hummus on them!! I will make smoothies with lots of cinnamon and ginger and nutmeg and anything else that tastes like pumpkin pie…. I do love them yes….. The hardest thing about this recipe is that you need to have cooked sweet potato on hand. That isn’t very difficult is it!? 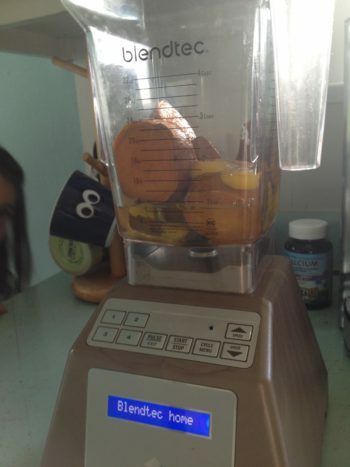 Blend it all up in the blender to get the skin all pureed – or if you peel the sweet potatoes you can mix it however suits you. I started my first batch with just the basic 2 ingredients and added things in as I went along to taste the difference, so I added the almond meal after the fact and just mixed it in with a spoon. These are very moist, so make sure to let them cook for a while before flipping. 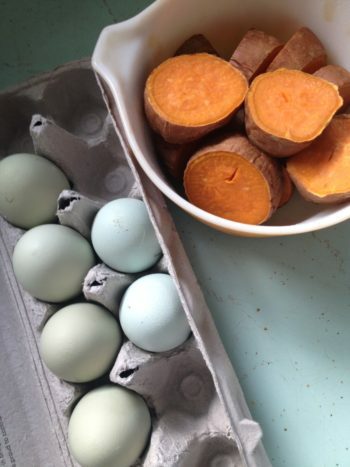 I love showing off my pretty blue eggs! Our chickens are not super consistent layers so we relish every one! I choose to blend with the skins on, you can do what you like. This is what happens when you get impatient. 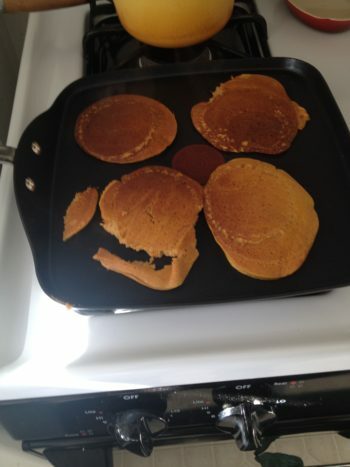 They really do flip well unless you go sticking the spatula under there too soon! 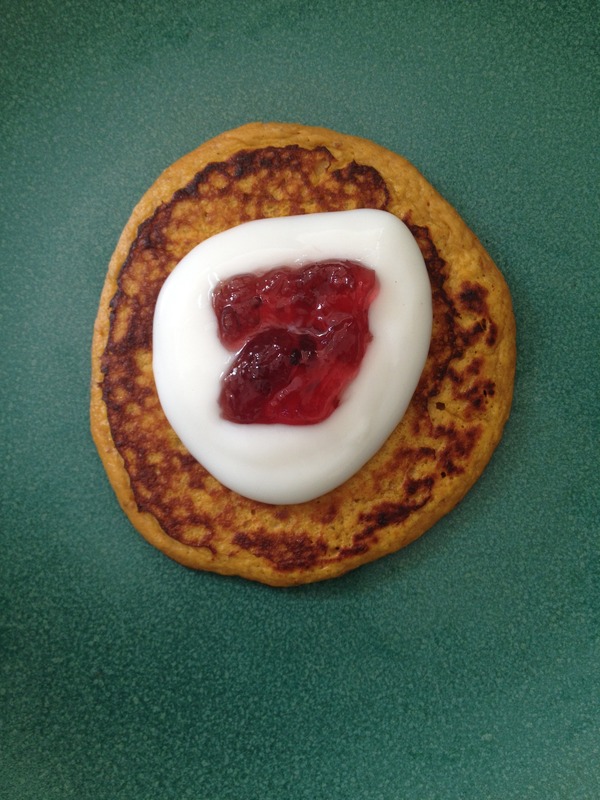 I enjoyed mine plain and topped with unsweetened coconut yogurt and a little bit of raspberry preserves – delicious both ways! 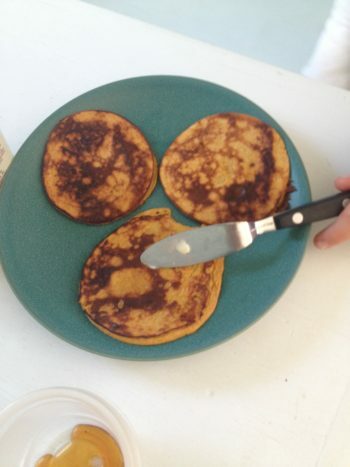 These are much less sweet than the banana pancakes – I still really liked them plain but Liesl loved them with a little maple syrup – I mean really how can you go wrong with sweet potatoes and maple syrup!!! I bet you could use a dense squash like butternut or kobocha or maybe even pumpkin – you should try it!! I liked these. They made me want to make pumpkin pie. I like that they are not too sweet-potatoey . I also like that they are not too sweet. I had some maple syrup and it was yummy too. You should try these! You can also enjoy them with some tasty maple syrup! A little goes a long way since there is some sweetness to these already. If you liked this make sure to click back over and try the 2 ingredient banana pancake recipe too! !